Nigeria is Africa's most populous nation with over 173 million citizens. It is also the country where Boko Haram, the jihadist faction, has terrorized the northern half for the past several years, with little competent response from civil and military authorities. Nigeria, in West Africa, and the jurisdictions where Boko Haram has been active in intimidation, kidnapping, general violence, and even massacres of villagers and university students. Graphic from The Economist. So, there is some point to paying attention to its presidential and general assembly election scheduled for March 28, which is a six week postponement from the original plans. The current President, Goodluck Jonathan, has presided over nearly five years of apparent incompetence in attempts to contain and degrade the Boko Haram. Teatree is unsure whether this is due to distraction with other matters, or the exposure of a hollowed out military with a lack of discipline and focus when confronted with this internal force of marauders (ie. think of the meltdown of the Iraqi army when attacked by the Islamic State). Officially, Nigerian leadership's reason to postpone the election was reported this way, "The security authorities claimed that a six-week military operation against the radical Islamist group Boko Haram, which is being conducted in the northeast of the country, was scheduled to begin on the same day as the election, leaving an inadequate security presence for voters in the rest of the country." President Jonathan's internal critics and political rivals for the presidency have called into question the postponement of the presidential elections, describing the extra weeks as a way for to him consolidate and build electoral support. President Jonathan's main challenger is General Muhammadu Buhari, described in a Feb 20 Newsweek article as a "devout Muslim, ... a former military general [who] has failed on three occasions (2003, 2007 and 2011) in his bid to return as Nigerian president since the country moved from a series of military rulers to a democratic system in 1999. He survived a Boko Haram assassination attempt last July when a suicide bomber aligned to the radical Islamist group targeted his car in the northern city of Kaduna." As many are aware, Nigeria is characterized as having a Christianized southern population and a Muslim northern population. The political and military leadership over the past decades of independence have generally taken into account the two mainstream perspectives with northern representation in roles of authority when a Southern individual was in power and vice versa. 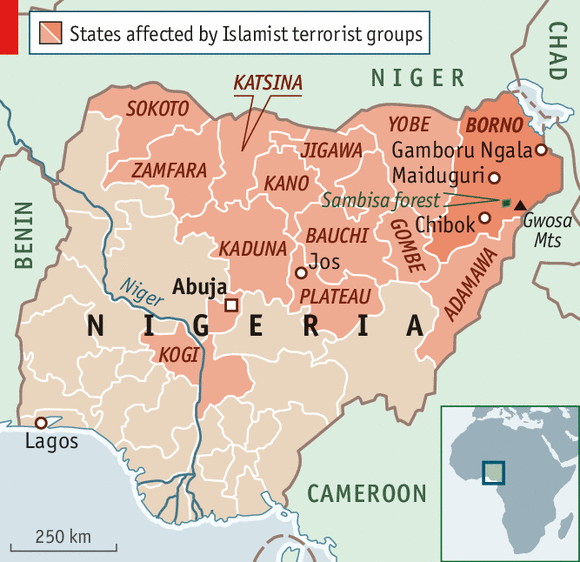 With Boko Haram now savaging regions of the country, this election has bigger consequences at stake. Essentially, who can best tackle the jihadist scourge is the leading concern (while addressing corruption stemming from managing oil revenues being the perennial issue). 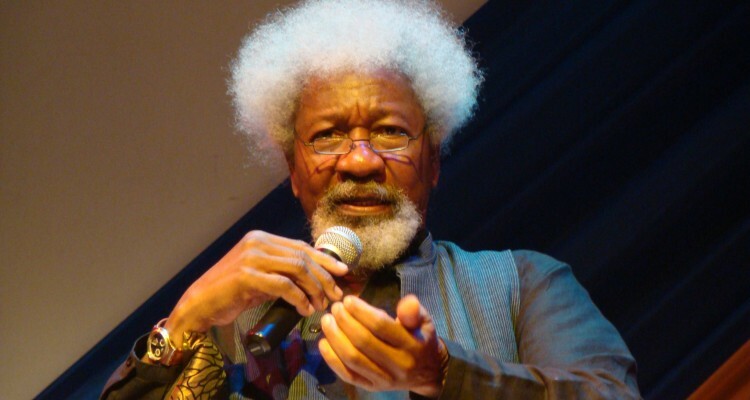 One of Nigeria's best known voices, Wole Soyinka, was interviewed by the BBC recently. A website, Culture Custodian describes the interview this way, "Soyinka admits that President Goodluck failed in tackling Boko Haram but that the problem began with previous governments. Soyinka asserts that General Buhari represented one of the more brutal phases of military dictatorship but that he is willing to allow him take control of the country now. He also goes on to say that Nigeria must be prepared to deal with any betrayal from its leaders as we cannot continue with the cycle of evil and irresponsibility." In recent days, a suddenly motivated Nigerian military has claimed advances against the Boko Haram, but Teatree wonders how much of these gains might be better characterized as pronouncements that might influence the electoral outcome. 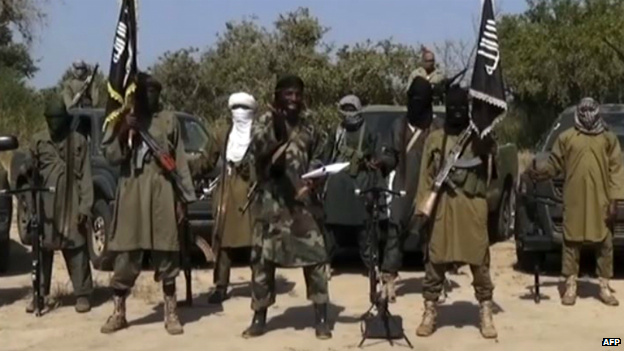 Boko Haram, for its part, has attacked villages in Cameroon, Chad, and Niger over the past weeks, regionalizing its conflict into four countries rather than just Nigeria. By now, most of us are at least aware of Boko Haram. In a BBC summary, we can read, "Founded in 2002; Official Arabic name, Jama'atu Ahlis Sunna Lidda'awati wal-Jihad, means "People Committed to the Propagation of the Prophet's Teachings and Jihad"; Initially focused on opposing Western education; Launched military operations in 2009 to create Islamic state; Designated a terrorist group by US in 2013; Declared a caliphate in areas it controls in 2014." A screen grab by the BBC from a video distributed from the group itself. In any case, jihadists across northern Africa and in the Arab world have displayed their ability to bring down governments, or at the very least significantly destabilize them (Yemen, Libya are the two latest) so Nigeria's election is being watched with more than passing interest.